I'm not intending to be doing any heavily laden touring, any that I do will be "credit card" touring, so which rack have you fitted and are happy with, on a disc equipped bike? The choice seems to be Tortec or Blackburn. I have rack eye's and don't want anything that involves the rear QR. Re: Which disc compatible rack? It depends on the bike, or more precisely, where the caliper is mounted. If outside of the rear triangle (ala CX and MTBs), then you need to find some way of getting around the caliper, usually. If inside the triangle then you can use pretty much any rack you like. We have a variety of these MTX racks, disc and non-disc, on our various bikes and are very happy with them. They are sturdy, and the Topeak MTX rack bags work well with them. It might also be possible to route the rack legs of a non-disc rack around small disc protrusions using adapters like the stainless steel plates in Tubus' rack adapter kits. Another vote for the Topeak racks (and bags) from me. 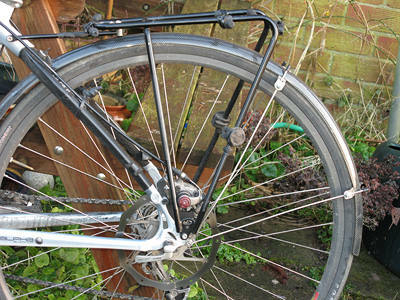 If your brake is mounted on the chain-stay then I'd recommend the "non-disc" racks; they don't stick out so far so they're a bit more aero (I have both and the "chain-stay" bike looks a lot neater when the rack is fitted). Agree, avoid disc-specific racks altogether unless your brake layout dictates you have to have one. Hydraulic brakes tend to be more compact than cable ones and can often be fitted in without any special provision. Using a bigger disc sometimes helps as well. The Blackburn is awful, and to be avoided at all costs. Not a comment on their racks in general, because in general they are excellent and very strong - but their disc-specific model is just a disaster. It mounts onto the wheel spindle using an over-length QR replacement. Makes rear wheel removal in case of punctures, a real pain, and doubly so if you have luggage on. These racks are tougher than they look and for anything short of full-on camping loads, they are the bees knees - although completely useless for day rides owing to the narrow top platform. If it doesn't quite work, it may be possible to fit a larger disc to move the caliper up and back a bit. Expensive but the "Old Man Mountain" stuff is great and, in my warped opinion, actually looks lovely too. Have tubus stopped making the Disco rack. Thanks folks, I'll check out the options mentioned. The bike is a Genesis Equilibrium with the disc on the seat stay, so probably needs a "disc specific" one - I'd spaced out to avoid the caliper. I previously had a rack with used spacers and long bolts to clear the seat stay mechanic disc caliper. I replaced it with an axiom streamliner disc dlx, which uses an extension plate to move the rack further back to clear the caliper. Also has the advantage of giving more pannier heel clearance. Not sure how sturdy the extension plates would be though. I need a new rack. 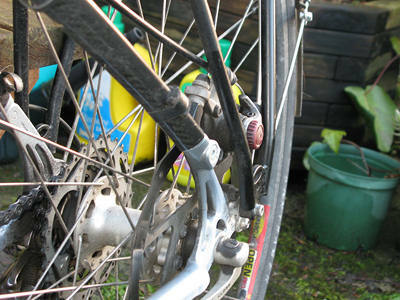 Had bodged an extension to get around the disc brake using 3 nuts on an extra-long bolt. The rack has snapped off through the eyelet. Loads on that side are regularly 6-10kg I guess, and I ride on very bumpy roads. Topeak tourist disc looks the best bet, any other recommendations? Avoid any design that avoids the disc by sitting wide of the axle. They snap. The bolts snap, or they snap in the frame. DAMHIKT. The one I finally chose has just such off-stands, but - crucially - the bolt holes are bored out deeply enough that standard length bolts are used to secure it to the dropouts. This minimises the bending load on them. If you're credit card touring, would a bike packing style saddle bag not be a simpler solution? I'm commuting. That involves hauling a laptop, change of clothes, paddling clothes, lock, bike tools, bit of food. I was replying to the OP's question, I hadn't noticed your thread necromancy. Apologies. This is only of any benefit if the standoff and the rack itself are stiff enough in bending (*). Otherwise fboab's comment applies. (*) IMHO this is rarely the case. Standard racks that mount using M5 bolts and no standoff are basically a compromise when they see heavy touring loads; disc racks that are spaced off are invariably worse. On balance I prefer the kinds of disc rack that are spaced backwards; again not a perfect compromise but at least it is one that is less likely to break your frame. FWIW I don't have much time for the Spyre brake design (in fact I think it is crap in several key respects) but it is much slimmer than most mechanical disc calipers, and can help to fit a rack if it is a seatstay mounted caliper. The standoff is a 10mm square block about 30mm long, with a counterbored recess to take the head of a 5mm cap screw. It's not bending much, so the bending/shear loads on the screw are the same as for a standard rack attachment. Maybe not up to heavily laden long distance touring, but fine for commuting/shopping/CC touring. The bending loads are (unavoidably) still there, but they are shared between the lower part of the rack and the frame pro-rata with the stiffness of each part. The stand-off can be as stiff as you like but all that happens is the bending moment bends the rack leg instead. If the frame is stiffer than the rack leg the frame will see most of the bending load, and that is the sort of thing that causes rack eyes to break off frames.